Most of the time it’s just a slow meandering stream. Then there are those times when the Brazos River grows into a massive volume of water spreading beyond its banks and washing through the countryside. The Brazos River has long made an impact on life in Fort Bend County. This river has the power to move you, and the power to make you move. The Brazos runs 840 miles across Texas to its mouth on the Gulf of Mexico, two miles south of Freeport in Brazoria County and is the longest river in Texas. This river was the major transportation artery that facilitated the early settlement and development of Fort Bend County. The Brazos River flows diagonally northwest to southeast through Fort Bend County and drains the broad central valley via numerous creeks and bayous. Sugar Land, east of Richmond, is fifteen to twenty feet lower than Richmond which makes a major difference in its relationship to the Brazos. A drive across the river on one of the several bridges for US90, US59, or SH99 will give you an impression of the depth of erosion along this part of the river. The recent partial closing of the Jodie Stavinoha Bridge (SH99) over the Brazos River was a result of the powerful erosion taking place in the Brazos channel. That last flood from the rains of Hurricane Harvey finally took its toll on the river bank at the bridge which now requires some stabilization work. The map image (above) shows how the Brazos continues to push out at some corners and move to cut off other corners. In the past the river has changed course radically leaving behind oxbow lakes now cut off from the main channel. That continued erosion of the banks of the Brazos is going to be subject of another study (Brazos River Erosion Management Study) to develop a permanent solution, if their could be one. According to city documents (Richmond) the Brazos river is eroding at a rate of 4 feet per year, posing a serious challenge to city and county officials. When you visit the Mirabeau B. Lamar Homestead Park (see http://fabricoffortbend.com/the-father-of-texas-education/) one of the information plaques posted in the park describes the original site of the fort to now be in the middle of the river because of the continuous movement of the river channel. A preliminary erosion study showed sections of the river near Richmond have shifted 400 feet from 1953 to 2012. 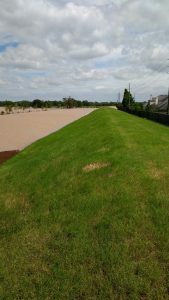 Residents of the Rivers Edge Subdivision, between FM359 and the Brazos River (MUD District 140) are also in the direct path of erosion having lot about 60 feet of river bank in the last 2 years. Flooding is a recurring event along the Brazos River. Early flood events had no reference mark for measure but still recorded damage. 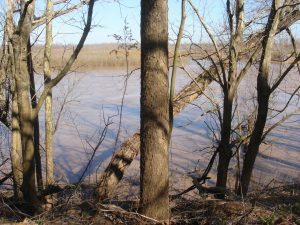 In 1828 The first recorded flood of the Brazos River eroded the banks along the river’s bends and brought down enormous trees. In June, 1833, Brazos River flooding contributed to an outbreak of cholera in the area. 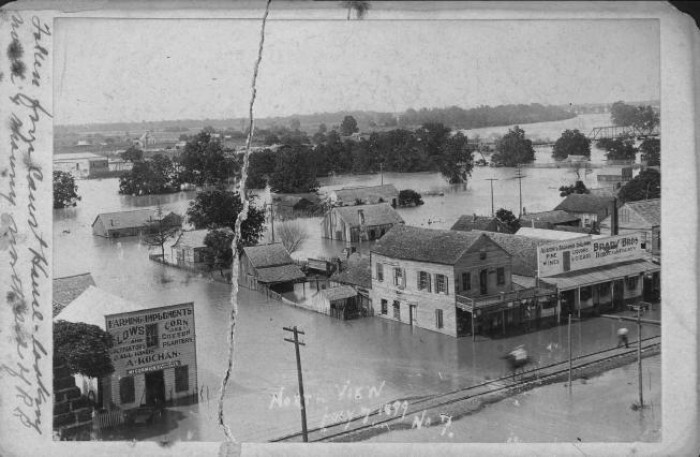 In 1875 Brazos River flooding caused most Richmond merchants to lose their business holdings. June 26, 1899, a tropical storm made landfall near the mouth of the Brazos River and proceeded across Fort Bend County. 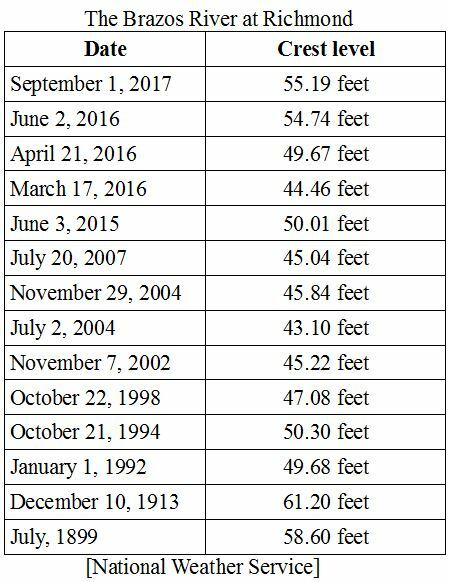 Tremendous rainfall ensued and the river gauge at Richmond measured a crest of 58.6 feet in July of that year. A more significant year of rain occurred in 1913, both upstream on the Brazos and local, and downstream the water came. The peak crest measured at the Richmond gauge was 61.2 feet on December 10th, 1913. 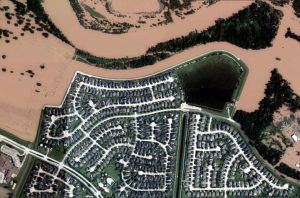 The Colorado and Brazos Rivers merged below IH-10 to the Gulf of Mexico because of the very widespread heavy rain, no flood-control reservoirs on the Colorado or Brazos River, and debris dams on the Colorado and Brazos Rivers. 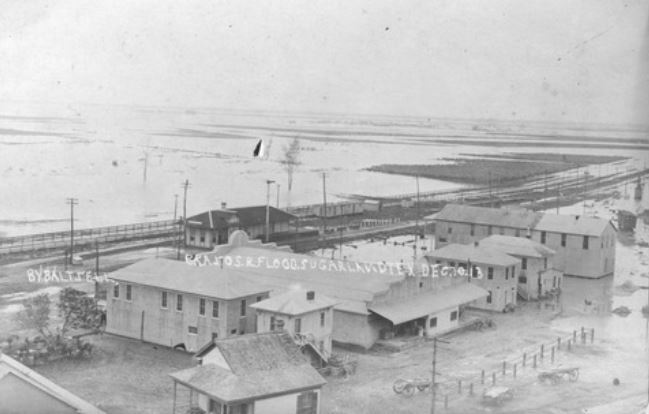 The 1913 flood caused the river to permanently change course. 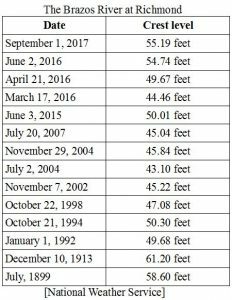 More recently with the “Christmas Flood” in December 1991, the river gauge at Richmond peaked at 49.68 feet January 1, 1992. The Brazos River was 5 miles wide west of Bryan and College Station. The Navasota River was well over 1 mile wide in Grimes and Brazos Counties. A huge lake over 10 miles long by 10 miles wide was created above the confluence of the Navasota and Brazos Rivers above Washington-On-The-Brazos State Park. Downstream, the Brazos River and Oyster Creek merged as the Brazos River flowed over the floodplain near Harris Reservoir. Thousands of previously unsuspecting home owners were flooded as Oyster Creek became several miles wide in Brazoria County. Residential flooding was widespread above Simonton and to the Gulf in Fort Bend and Brazoria Counties. The river level has exceeded that 1992 level four times since then. A crest of 50.3 feet in October, 1994, then three times in the last 3 years, measured 50.01 feet in June 2015, 54.74 feet in June 2016, and for comparison, the peak crest measured 55.19 feet at the Richmond gauge after Hurricane Harvey, September 1, 2017. The planned communities you know of, including Rivers Edge, Pecan Grove, Riverpark West, Riverpark, New Territory, Greatwood, First Colony, and Sienna Plantation simply could not exist without the levee systems built to shield them from the Brazos River and its tributaries. When it is raining hard behind the levee, diesel-powered pumps are used to discharge storm water over the levees from the protected side into the river. 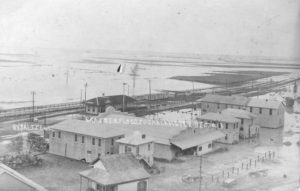 Constructed by private developers in Fort Bend County these levees were built by creating localized state government entities called Levee Improvement Districts, known as LIDs. Typically you are paying property taxes to these entities. Some years back the levee protecting my neighborhood was raised another eight feet or so. This made all the difference in staying dry during the flood events of recent years. When you can stand on the levee and see the reach of the Brazos up against your neighborhood you know you are close. The most recent flooding has reminded us once again of the power of the Brazos River to move us, and it may be time for me to find some higher ground. This entry was posted in Fort Bend County History and tagged Brazos River, Brazos River Erosion Management Study, First Colony, Fort Bend levees, Greatwood, Historic Floods, Hurricane Harvey, Jodie Stavinoha Bridge, New Territory, Oxbow lakes, Riverpark West, Rivers Edge, Sienna Plantation. Bookmark the permalink.